As I mentioned earlier this week, Wednesday was my day to do my civic duty for my fellow citizens of Dallas county. 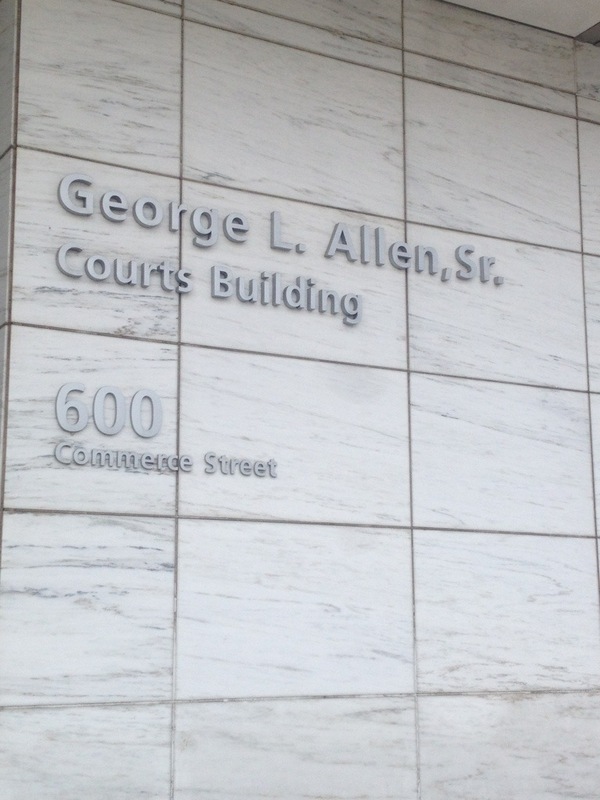 Yes, that’s right: the ever-dreaded jury duty. I definitely did not want to get picked. Let’s just say my views are often not shared by the citizenry of North Texas. And unfortunately like The Grammar Belle, I have a tendency to be given leadership roles in volunteer groups. And missing work means making up the time at night when I’d rather be gardening, hanging out with Bruce and the Gs, or even blogging. That being said, I really didn’t have anything to compare the potential experience to. I was never chosen for jury duty in Ontario nor California, so Texas is my only point of comparison. I have to say that Dallas seems very efficient and responsible compared to my Tarrant county (the area west of DFW airport, court is in Ft. Worth) experience. For that time, I was told to show up at noon for that jury duty and had to hang around until around 5 pm, only to be the last potential juror to be questioned and once the lawyers heard what I did and where I went to university, they said, “thank you but your services are not needed.” That case was a felony DUI case, a felony because the driver had his young son in the car. I don’t know how it ended up, but I still wonder what happened since so many of the potential jurors seemed to want to try the man before the actual case was heard. explain why we must take this job very seriously and why, along with voting, it is what separates the U.S. system of government from many others. (Unfortunately far too simplistic of an explanation says the poli sci major). He was an engaging and powerful speaker and in my opinion would have been a good preacher or motivational speaker. It was all fine with me. I did work email. I wrote my brother a birthday card. I read a magazine. I made some notes. I did my usual airport people watching and was pleasantly surprised that most people were dressed in their Sunday best or for a job interview as requested in the jury summons. No pajamas or clubwear present. And then they selected two big groups. About 150 people in the first, 50 in the second. It was by your jury number and mine was 753. Guess what: after another 30 minute break that turned into almost an hour, I was dismissed. And that was it. Back to work I went and I was in my desk before 1 pm. 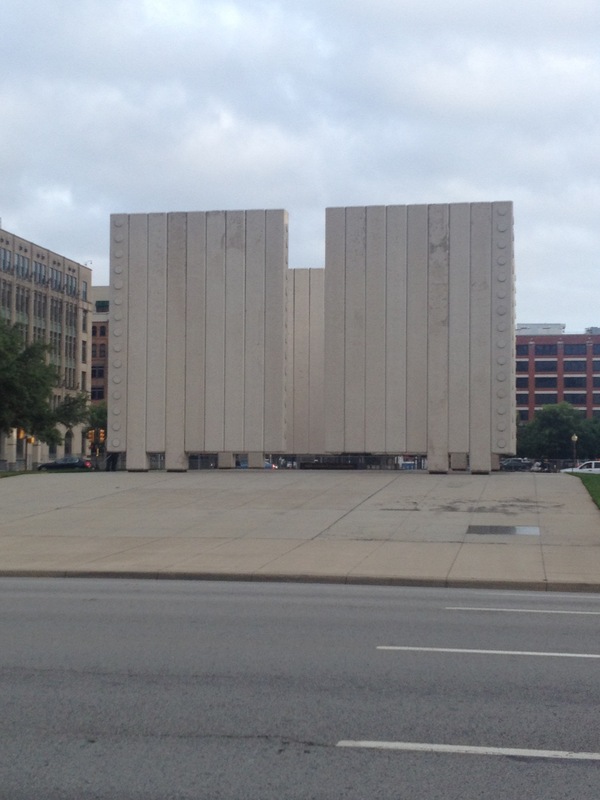 And I had to drive next to the tourist covered grassy knoll to get back to my office. So it was a day of US history and government reminders. 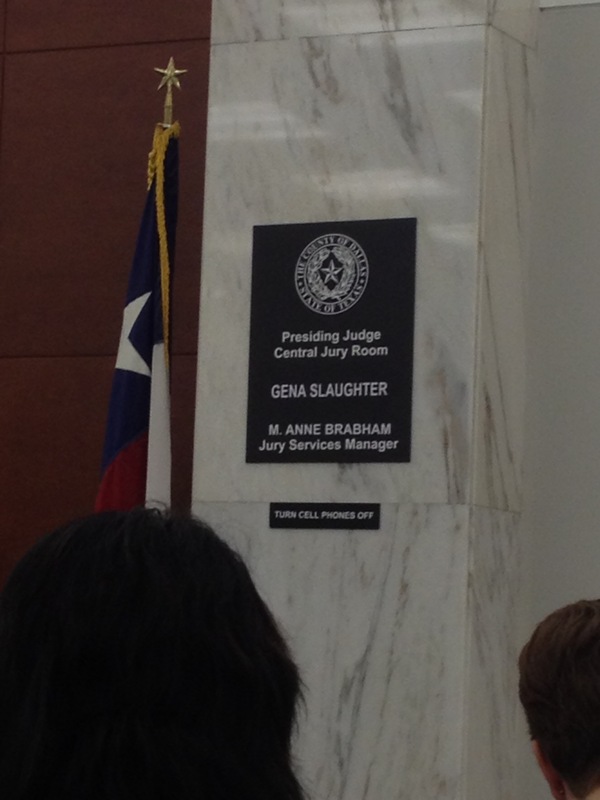 This entry was posted in So and tagged courthouse, Dallas, JFK, Julie Petroski, Jury duty, Texas. Bookmark the permalink. I’ve always been curious enough to want to serve on a jury, but have been called twice and dismissed after two days both times. The first time, I never even made it into a courtroom. The good thing was, both two day jury duty stints coincided well with my work schedule, and since my employer pays for jury duty time off, I got a paid four day weekend both times in exchange for a few hours of sitting around in the courthouse dungeon…. I’m just not a patient waiter. If I didn’t have work waiting for me, I probably wouldn’t mind sitting around and waiting. Or serving on a jury for several days. 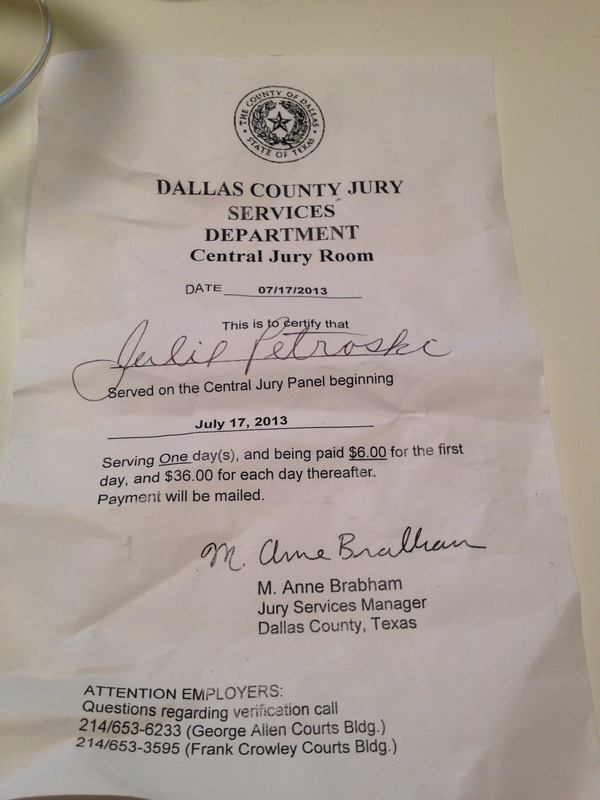 Getting paid/losing pay isn’t an issue for me because my employer pays me during jury duty. 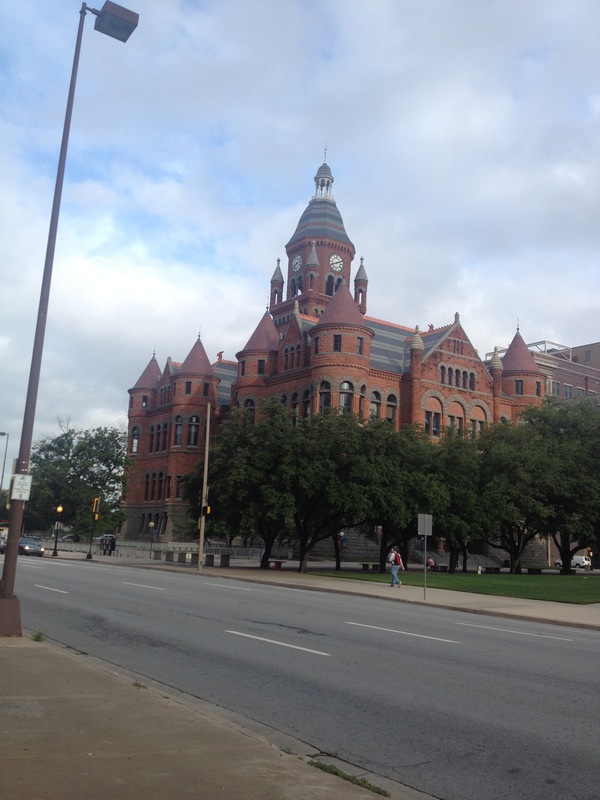 What scared me with my first experience with jury duty (in Ft. Worth) was that most people seemed to forget about “innocent until proven guilty” or understand what the right to a fair trial, tried by a jury of your peers meant. Several people wanted to “take care of” the person on trial themselves. Many expressed that they felt the man needed a punishment that was not in proportion to the crime (ie: death penalty). Sure, many were trying to get out of their service, but it was an ugly side of people that I really didn’t care to see. I’ve never been called. I know lots of people who have, but I haven’t. 1. I’ve always been fascinated by the legal system. I’ve planned to be a lawyer more times than I can remember, with the latest being in my late 30s! 2. I’m bossy at the core. Who better to boss around than a jury of my peers? 3. As the victim of a crime who experienced more than one crazy jury, I know there are good people out there, victims and their families, who need smart, sane people to help them get justice. 4. Somehow my mom almost always got chosen for jury duty! She wasn’t foreperson (that I recall), but she always came home and filled me in with the details. I knew I wanted to be a part of that when I grew up! You’re welcome, Grammar Belle! And your reasons for wanting to serve are admirable, except for #2. I think it’s funny that I wanted to be a lawyer at one time, but now have no desire to sit in a courtroom. Go figure. My friend just spent two whole weeks doing precisely nothing! I did jury duty years ago and actually got picked a couple of times. That’s what I was afraid of. Two weeks away from work would be a nightmare for me. My clients and colleagues wouldn’t like it either.